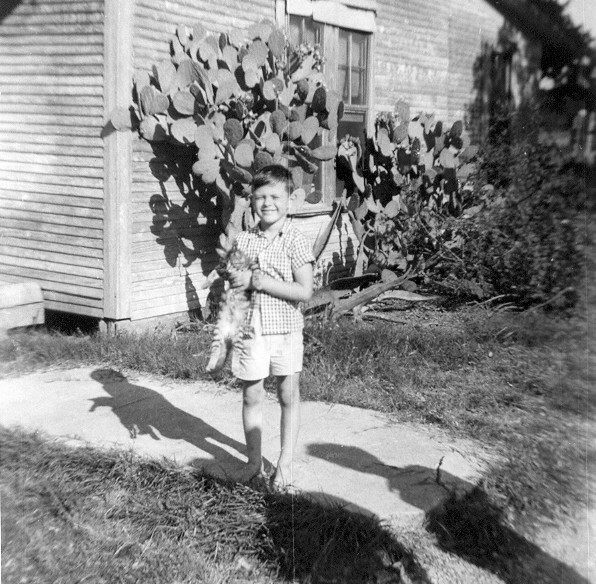 Here I am standing on the front walk of Nano and Grandpa's, holding one of the kittens their resident kitty factory, Bo Diddley, was kind enough to produce for us. That old calico must've lived to be 100, but she still kept pumping them out. The only brood she had that was ever a problem was the one where us kids weren't around to drag them out and play with them every day, so they grew up wild. I probably still have some of the scars on my hands from the first attempts to extricate them from under the back porch. They were all claws, let me tell you.